At Cahaba Snake Trap™, we value our customers’ input. Whether it’s answering questions or hearing how a catch went, our snake experts are always ready to hear from our shoppers. We encourage you to read what previous buyers have written about our products and services to see for yourself that we make trapping snakes a breeze. Having a snake be present in your home may be a hassle, but with our help, getting it out doesn’t have to be. Hi, Buddy, just wanted to share a tip with you that has worked well for me with the snake traps (just got #49) and for friends who I told about the traps. I push a bamboo plant pole into the ground about one inch inward from the edge of the trap. 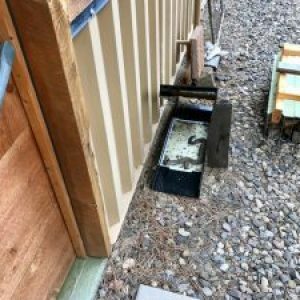 That prevents the snake or possum from pulling the glue board out of the trap. I missed doing the one end of a trap this week and found a snake had dragged the glue board about six feet from the trap. My doctor bought the traps and kept complaining about the glue boards being dragged all over the yard. I told him how to stop this and now he is happy with the traps. It is a simple solution, but it took me a while to think of it! I never saw this on your site, but if you already tell people this, sorry to bother you. Just ordered another box of glue boards. Maybe it’s time to invest in your company! Today is July 20, 2018. It’s been ONE YEAR EXACTLY since I was bit by the rattlesnake at our backdoor at our cabin in Colorado. Well...late this afternoon I found this rattlesnake in our snake trap. Weird coincidence?! She is still alive, barely. Had to have been caught between 2-5:30pm today. The above story from a gal who spent 3 days in the Parkview Hospital ICU (Pueblo, CO) last summer! WAS NO FUN, not to mention the $130,000 hospital bill which was fortunately covered by ACA medical insurance, and your trap may have just prevented a similar incident. Our 3 grandkids, my son & daughter-in-law just left for Utah last Tuesday after visiting us on their vacation, wondering if any of our stories about rattlesnakes are true (of course I showed them the traps but the effectiveness is now confirmed). As explained, we’ll tell our story at the Stonewall FPD Fireman’s appreciation potluck tomorrow and see if we can generate enough interest to buy a few more traps from you. Also, your expertise in helping identify this type of rattlesnake would be greatly appreciated. I’m very familiar with Western Diamondbacks in the SW Sonoran Desert region however this IS NOT one of those. This snake has NO diamond pattern, is slightly moss-green colored and sports a pointed tail with 8 small rattles. A local neighbor suggests it may be a “Pygmy Rattler” but he’s not native to this area either. There’s a myth that rattlers don’t exist above 6,000 feet but folks have seen/killed them as high as 8,000 in this neck-of-the-woods. Thanks too for the 2-minute freeze tip to help release the insert paper... might prove helpful to others adding this next time instructions are printed? Have a good weekend and I’ll be in touch. Caught a copperhead snake this week using your trap that we purchased from Little Hardware. The snake was where we always walk our small Maltese dog. Thank you for saving us from a poisonous snake bite! Never did I imagine it would be necessary to place a snake trap INSIDE my home. However, after running thru the opened front door, and successfully alluding capture for two days, I was eager to get the large lizard out alive and unharmed for his sake and mine. Within two hours of placing the Cahaba Snake Trap he was humanely captured and I was able to quickly and easily release him outside. Your Snake Trap is a great invention and its use is clearly not limited to just snakes! You came to my house the day that I contacted you about a snake that my daughter saw in our garage. You placed two large traps in the basement garage area and after a week I was beginning to think that it had found its way back outside. We left for vacation and when we returned five days later the snake was caught. I have attached pictures to see if you can identify what type of snake it was. Please respond by e-mail or you can contact me during the day. I definitely feel better now that it has been caught but just having the traps in the basement has allowed me to park and walk through my basement again. Thank you so much for all of your help this week. I rec'd my traps yesterday in the mail and we have them set up in the basement and the house. It has given me piece of mind, even though I sleep with a metal pipe right next to my bed. As I explained, I am deathly afraid! I also wanted to thank you for all of the information that you sent with the traps. We are pleased with them, it will save us money in the long run since they are reuseable. I recently called you to order one of your snake trap and we spoke at great length about the trap, snakes and my hatred I have towards snakes...good ones or bad ones...I hate them all. I put the trap in the location I spotted snakes before and I finally caught my first snake about a week later. I have one less snake to worry about around my house. Snakes scare the heck out of me...I'd rather have rats, mice and lizards all around my property than one snake. Thanks so much for coming up with such a unique way of trapping snakes....I'm going to use mine forever. I recently Purchase several Cahaba’s Snake traps to be used at some of my Pest Control customer. Since then I have caught up to 3 snakes per trap at some of my customer home. That is impressive. Now I am installing the traps not only at some of my residential pest control customers but at my commercial customers too. If you have any snakes around your home or Business use the Cahaba Snake traps. The trap is easy to use and very effective.I will recommend it as the best snake trap in the market. I purchased the Cahaba Snake Trap to use on my boat dock. I had seen a water snake around the boat dock. It was nesting in foam near my wave runner. This was not a comfortable place to have a snake with many young children out on my dock. I had tried for over a year to catch the snake with a net and mechete. The snake was too elusive and too quick. I found several traps on the market but most were made of cardbard, I knew that would not last. I found the Cahaba Snake Trap made of plastic and ordered one and placed it on my dock near where I had seen the snake. Within several days the snake was caught. I assumed my snake problems were over but decided to relocate the trap and within a week I caught a 2nd snake. I ordered more glue inserts and have caught 3 snakes. I leave it on my dock and in addition to the snakes I catch quite a few insects. The trap is easy to use and quite effective. I use it on my dock, so it is in a wet situation as the trap is only a couple of inches above water. I hope my snake problems are over but I am confident my Cahaba Trap will catch them. These traps work great. 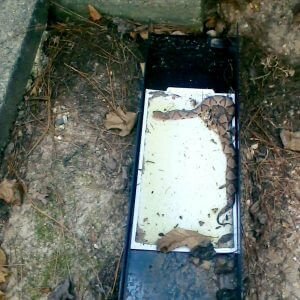 I am a pest and critter control owner/operator and have been using the Cahaba Snake Trap since they started making them. I have customers ask me all the time do the snake traps really work? My answer is always this if you have a large population of snakes in the area that you place the traps, you wll catch snakes. if you donot have a large population of snakes you may not catch anything or at least it may take a while. The other part of the answer is this. There are simply no other viable optiotions for snake control. Yes there are sprays, powder, and granules that are labeled as snake repellent, I have tried them all with no results and no confidence to take someone's hard earned money to apply them!!! The Cahaba Snake is in my opinion the only option worth spending your money on! !